Whether we're pampering our puppers with designer sweaters or bottles of canine beer, human trends have a way of bleeding into the pet market. It should come as no surprise then that dogs are now being invited to join the food truck craze. 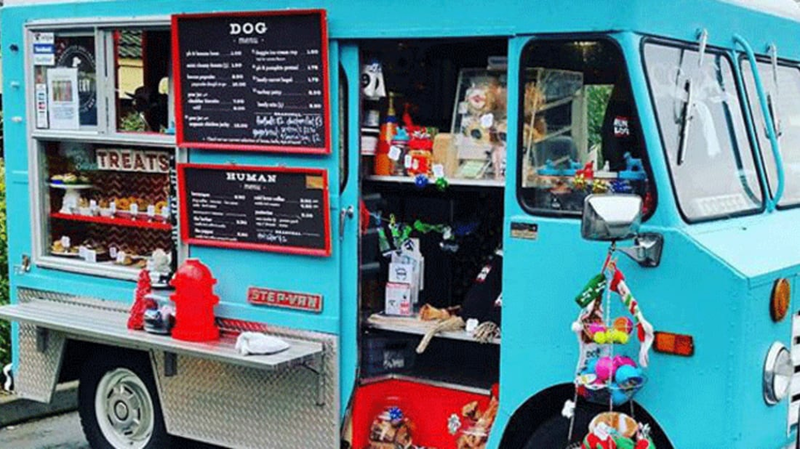 As the Associated Press reports, The Seattle Barkery is a canine-centric food truck serving up treats to local dogs and their owners. Ben and Dawn Ford, the husband-and-wife team behind the truck, have been parking their 1968 Chevy Step Van outside dog parks, farmer's markets, and dog-friendly breweries around the city for the past 10 months. Their menu includes items both people and dogs can enjoy, like pumpkin pretzels, peanut butter-banana cookies, and mini cheesy doughnuts. Other offerings, like their air-fried chicken feet and duck necks, are perhaps better left for the canines. All the treats are homemade and, as Dawn tells the AP, "aren't filled with ingredients you can't pronounce." Though The Seattle Barkery is unusual in the food truck world, it isn't the only one of its kind. Fido to Go in Chicago serves up fare like bacon cheeseburger-flavored frozen yogurt, and Milo's Kitchen Mobile Treat Truck includes a play area and doggie selfie station for their four-legged patrons in San Francisco.